"Just an old man in a loincloth in distant India: Yet when he died, humanity wept." This was the observation of a newspaper correspondent at the death of Mahatma Gandhi. The tragedy occurred in New Delhi as the gaunt old man walked to a prayer-meeting and was engulfed by one of history's great ironies - a life-long pacifist and promoter of non-violence struck down by an assassin's bullet. independence of India from Great Britain. It was a bittersweet victory for Gandhi because along with India's independence came the partitioning of the sub-continent into two separate states - Muslim-based Pakistan and Hindu-based India - an action he thoroughly opposed. Gandhi did not take part in the celebration of India's independence. It was one of those shining Delhi evenings, not at all warm but alight with the promise of spring. I felt well and happy and grateful to be here. Bob and I stood idly talking, I do not remember about what, and watching the Mahatma advance toward us over the grass, leaning lightly on two of 'the girls,' with two or three other members of his 'family' (family or followers) behind them. I read afterward that he had sandals on his feet but I did not see them. To me it looked as if he walked barefoot on the grass. It was not a warm evening and he was wrapped in homespun shawls. He passed by us on the other side and turned to ascend the four or five brick steps which led to the terrace or prayer-ground. Here, as usual, there was a clump of people, some of whom were standing and some of whom had gone on their knees or bent low before him. Bob and I turned to watch - we were perhaps ten feet away from the steps-but the clump of people cut off our view of the Mahatma now; he was so small. Then I heard four small, dull, dark explosions. 'What's that?' I said to Bob in sudden horror. 'I don't know,' he said. I remember that he grew pale in an instant. 'Not the Mahatma!' I said, and then I knew. although there may have been an instant or two of half-consciousness. I recoiled upon the brick wall and leaned against it, bent almost in two. 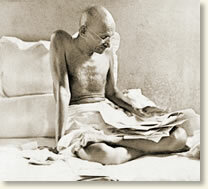 I felt the consciousness of the Mahatma leave me then-I know of no other way of expressing this: he left me. ...The storm inside my head continued for some little time-minutes, perhaps; I have no way of reckoning. ...lt was during this time, apparently, that many things happened: a whole external series of events took place in my immediate neighborhood - a few yards away - and I was unaware of them. A doctor was found; the police took charge; the body of the Mahatma was, carried away; the crowd melted, perhaps urged to do so by the police. I saw none of this. The last I saw of the Mahatma he was advancing over the grass in the evening light, approaching the steps. When I finally took my fingers out of my mouth and stood up, dry-eyed, there were police and soldiers and not many people, and there was Bob Stimson. He was rather breathless; he had gone somewhere to telephone to the B.B.C. He came with me down the steps to the lawn, where we walked up and down beside the flower-bed for a while. The room with the glass doors and windows, by the rose garden at the end of the arbor, had a crowd of people around it. Many were weeping. The police were endeavoring to make them leave. Bob could not tell me anything except that the Mahatma had been taken inside that room. On the following day he told me that he had seen him carried away and that the khadi which he wore was heavily stained with blood." Vincent Sheean's account appears in: Sheean, Vincent, Lead, Kindly Light (1949); Ashe, Geoffrey, Gandhi (1968). "The Assassination of Gandhi, 1948," EyeWitness to History, www.eyewitnesstohistory.com (2005). 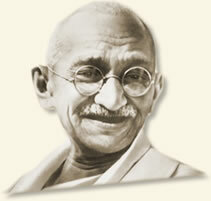 "Mahatma" is an honorary title and term of reverence rooted in the Sanskrit term for "great souled." It was conferred on Gandhi in 1915 by the Asian Nobel laureate Rabindranath Tagore. Gandhi's assassin, Nathuram Godse, was described as a nationalist and right-wing Hindu who blamed Gandhi for the partitioning of India. He was executed in November 1949.